At 6,463 feet above sea level in the mountains of Graubünden, you'll find amazing views—and a one-of-a-kind hotel experience. A new concept from the brothers behind Null Stern Hotels redefines the minimal hotel experience. There are no walls, no hotel property. What you're getting is a bed with a couple of nightstands and lamps. 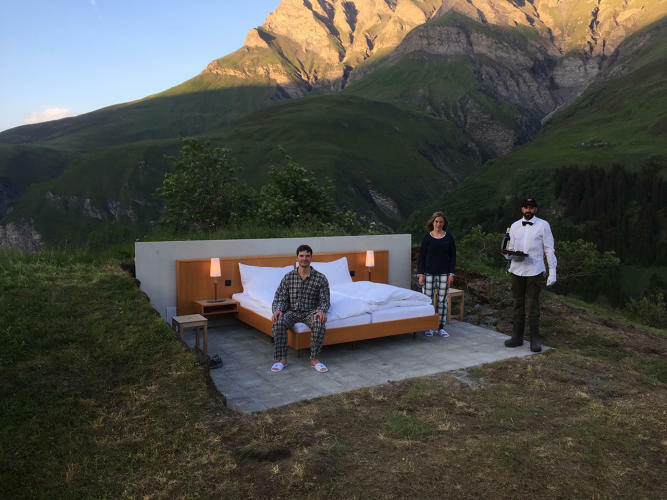 But what you're paying for is the incredible view that comes from sleeping on a Swiss mountainside without a roof over your head or walls boxing you in. You won't find a bathroom on-premises (however there is a public restroom 10 minutes away from the hotel), but you will get a butler-delivered salami sandwich and coffee in the morning. The price is around $250 a night. Guests be warned: While the room is bookable every night between spring and fall, there's a chance your reservation could be cancelled at the last minute due to poor weather. Frank and Patrik Riklin introduced the term Null Stern, which translates to “zero stars,” to describe their hospitality endeavor. They previously opened a hotel at a former nuclear bunker located in Teufen, a city in northeastern Switzerland. Sound like something you'd plan a trip around? Head over to the Null Stern Hotels website.